Every so often, I will feature guest posts from writers who actually have important and interesting things to say. My friend, Daniel Bell, is an up-and-coming copywriter based in Orlando and has written a few blog articles I’ll include on this site. You can do a lot of things on the Internet. Play games with strangers around the world, check e-mail, take an online class, laugh at funny videos. But most seniors do not want t get wrapped in all of that. They’re keeping up with family on Facebook, but that’s about it. So what if you wanted to get your favorite news, whenever and wherever you chose, in the places you want it? The first thing is to learn is what a social network is: It’s basically a site where you can share, read and search public information. You can also interact with people both privately and publicly. You’ll have the ability to do this once you have created your own profile with your own information about yourself. According to Elise Moreau, a social media expert and contributor to Lifewire.com, the top 5 social networks that people use are Facebook, Twitter, Youtube, LinkedIn, and Instagram. Every one of these can be accessed through a laptop or a mobile device. You can use a website or even the network’s own mobile application. Every site is easy to join and they have help right there to help you get started. Just follow along and you’ll be fine. News stations are constantly sharing breaking and slower news online. 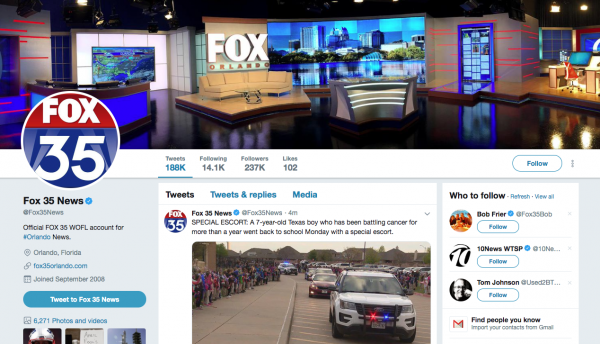 And because people love to use social media, news stations have created their own profiles that people can follow. It’s a great way for people to see what news they have first before anything else. And you can build your entire social media stream to contain nothing but news. For example, let’s say you wanted to follow your favorite news station on Facebook. I live in Orlando so I might want to look for the local FOX station. To actually get the content the station posts on their Facebook page, you need to click on the “Like” button. Repeat this for as many news sites as you would like to receive the news from, and any time they post news stories, you’ll see them. You can do the same thing on Twitter, although you would click the Follow button instead of the Like button. Search for your terms in the Twitter search bar, and visit the profiles that come up. A trend is something that is widely mentioned or discussed on the Internet, especially in posts on social networks. Basically, a trend is a topic that is popular on the Internet at the present time. It could be a sporting event like March Madness or the World Series, or a particular political event or current event. Breaking news is a good trend to follow, because random stations will post their own #BreakingNews hashtags. You can get news from all over, and you don’t have to follow any particular stations to do it. If you put #breakingnews (don’t forget the #) in the search bar of your favorite social media sites, different profiles that post breaking news with that hashtag will appear. You can search for it occasionally and see what new news is coming up, and it’s like having your own 24-hour breaking news newspaper at your fingertips. There’s a lot more to the Internet than just searching for news, but this is a good way to get started, to keep up with what’s happening in the world, and to learn how you’re going to use it all so you can navigate it and see what it has to offer.